Situated on the edge of the Forrest of Bowland, Lancashire, we are a friendly family run business. We pride ourselves in our highest quality produce, home reared Aberdeen Angus Beef, Glouchester Old Spot Pork and Bowland Lamb. 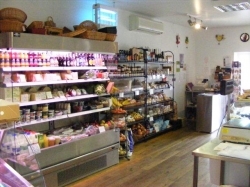 Selling a full range of dairy products from Little Town Dairy such as yogurts, creme fraiche and ice-cream and more, we also have our own Tea Room serving refreshments and country home cooked foods. As specialists, we are proud to offer traditional homemade convenience meals, pies and home baking for all customers who visit, as we ALWAYS use local suppliers of bakery, cheeses, vegetables and conserves. For all your pet needs, we also have a full range of animal feeds and bedding. Seasonally we sell a small range of Plants and shrubs also family sourced. Why not drop in to our shop and see our home reared meats, dairy products and enjoy some refreshments in our Tea Room or simply call us on 01772 786198.